Who wouldn’t like a flash of golden orange in their garden from time to time? If the beautiful plumage of Orioles isn’t enough to entice you, their sweet melody surely will. If you are in the West, you have most likely seen the Bullock’s oriole. If you’re in the East, you have seen either the Orchard Oriole or Baltimore Oriole. If you’ve seen some of these birds and would like to see them more often, then you would need to entice them with food they love. To do that, better get yourself the best oriole feeder. Orioles can actually feed on hummingbird feeders if you don’t have a special feeder prepared for them, but they sometimes end up tearing through the ports as these are too small for their beaks. If you want to make sure these lovely orange-breasted birds stay in your place, you need to offer them exactly what they need and want. Worry not I have listed the top choices for oriole feeders in the market. One of the things that can attract orioles are bright colors, more specifically, the orange color. So I when I saw First Nature Oriole Feeder, I knew it was great. Its orange color is attractive enough for orioles (and other birds) to get curious. If you have a lot of birds coming to your backyard, you would need a feeder that’s large enough to accommodate all of them. 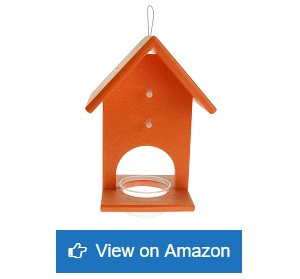 This 32-ounce bird feeder can last you a couple of days so you wouldn’t have to refill it every few hours. What I love most about it though is that it is made of thick plastic. One of the issues with feeding birds is that sometimes bears and squirrels would come over to have a drink of their own. This happens especially if you use a mix of water and honey or sugar. So when bears and squirrels come in and knock your glass feeder down, well good luck to making it work again. But with First Nature 3088, even if bears knock it over again and again, it doesn’t easily break. Keep in mind, though, that plastic can become brittle over time, especially when exposed to elements. It didn’t come as a surprise to me when the plastic became brittle after two years of usage. I do think that for the price point, it is good enough. However, after preparing your nectar mix, make sure you tighten the base part against the plastic bottle. It can easily disengage and spill the mix if you’re not careful. All in all, for its price, First Nature’s 32-ounce Oriole Feeder is a great bang for your buck. Do you know what an Oriole’s favorite meal is? Fruits! 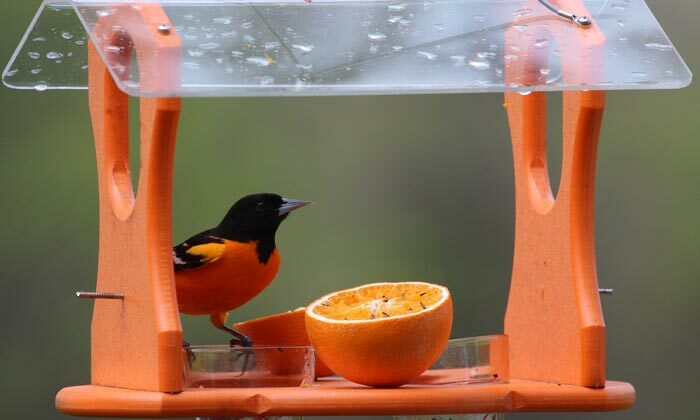 So if you want to attract more Orioles in your vicinity, the ultimate Oriole feeder is one that can hold fruits and jelly. One good option is Birds Choice Flower Oriole Bird Feeder. Although not as flashy as other bird feeders, this one is very effective. I actually like its lightweight, elegant design, which would work great for those who want to maintain the style of their garden. Sometimes, colorful feeders tend to give some gardens a cheap look this one doesn’t because of its simple black design. You won’t have to compromise your design and still attract birds in your garden. 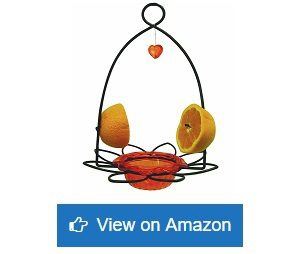 Birds Choice feeder allows you to put two halves of a fruit (preferably orange) on the pegs on the side. You can also place jelly on the cup at the center. Fruits and jelly are your top oriole food choices which make these birds flock to your place. I love that it is made of sturdy metal, so it can handle the weight of several birds. However, because of its small size, only a few birds can perch at a time, causing others to fly off. A solution would be to get two of these if I want more birds, although it’s a bit more expensive than others. This is a lovely choice for oriole feeders if you are worried about the style aspects, though it is more expensive than other feeders in the market today. Aside from being oriole-friendly, this Birds Choice oriole feeder is nature-friendly as well since it is made from recycled plastic. That’s a great plus for all nature-lovers out there. With a size of 13 inches by 8 inches, and a height of 7 inches, this is one of the biggest feeders in the market. 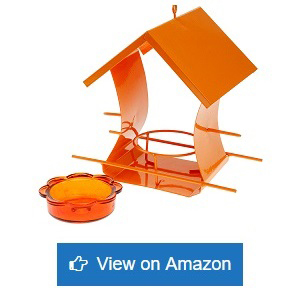 This means more birds can perch on your feeder at a time. It is colored orange so it attracts birds easily. Cleaning the unit is also hassle-free. But you won’t get orioles if you don’t offer their favorite food of oranges and jelly, which you can happily place in this feeder. There are two pegs for your fruit halves (one on each end) and two cups for the jelly. But what I love most is that it has a transparent acrylic top. This is dual-purpose: one is that it shields the entire feeder from rain and somehow weather-proofs the unit and two is that it holds the entire feeder up while showcasing the birds. You will have an unobstructed view of the orioles while they eat. However, my favorite feature is also what is causing confusion for some orioles. When they come and see the jelly, they head over excitedly. But sometimes they don’t know where to perch since when they approach, something they couldn’t see is preventing them from perching – and that is the transparent acrylic top. I would have loved it if there’s somewhat a wire extension at the bottom part that birds can perch on and approach the inside of the feeder. With its bigger size, it’s not surprising that it costs two to three times more than other feeders, but it’s definitely worth every penny. If you’d like to be able to feed orioles in several ways, Birds Choice 1009 Oriole-fest is a great option. 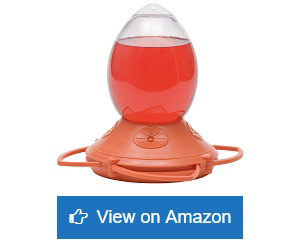 This feeder allows you to offer three types of oriole food: nectar, jelly or fruit. You can offer just one or two or all three types to your visitor birds, and they’ll surely come back for more! Like many feeders, the 1009 Oriole-fest is made of thick, orange-colored plastic. It has four port-holes for nectar feeding and four jelly cups molded into the entire base. It utilizes the hanging rod as a skewer for an orange half. What I like about this feeder is that it has four molded perches where birds can easily stand. 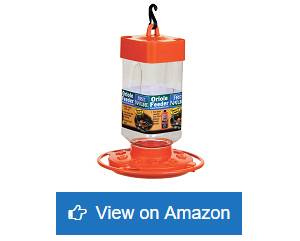 And if you’re looking for an oriole feeder that deters ants and bees, this is a good choice as it has a built-in ant guard and includes eight pieces of silicon bee guards. One thing I don’t like about the 1009 Oriole-fest is that the feeder itself tends to sway and spin when birds land on it. When it spins, it gets unscrewed from the hook, causing it to disconnect from the hanging rod and fall to the ground. Good bye birds when this happens. My solution to this was to first make sure the feeder is screwed in tightly and second to use a chain or rope to hook the hanging rod to so it can spin freely without disconnecting. Also, you can only place 12 ounces of nectar, which is too limited in my opinion. You would have to refill a couple of times a day if you want to keep attracting orioles. This can be a drawback because some birds don’t come back if they try sipping for nectar the first time and find none. Being multipurpose has its perks since you can give the birds all they ever want, but it also has its drawbacks. Since its base is made of plastic, you can expect it to work great until about a couple of years when signs of cracking start to show. But for the price, it’s definitely a great option. If you’re looking for a feeder that can last you a lifetime, I would greatly recommend Woodlink 35319 Metal House Oriole feeder. As its name itself implies, it is made of metal steel which makes for a sturdy feeder. The mini roof serves well as jelly protection against rain and falling leaves and branches. You can easily place orange halves on rods located on the opposite sides of the feeder house, while having jelly inside the “house” in a jelly dish. This bright orange feeder is easy enough to clean, too. One problem I encountered with this feeder is that its orange coloring chips off easily. If you are looking for bright orange feeders, I would recommend those made of thick plastic like First Nature 3088 or the Poly-Recycled one by Birds Choice. I do believe this one lasts a really long time compared to others, but you might have to paint it over from time to time. While accessing the jelly is easy enough for the birds, I notice that some find it awkward to eat the orange. I realized that it’s because when you place the orange half, it is facing directly outward. The perching rod extends only a short distance from the “house” that the birds could not reach the insides of the fruit. If only the rod extends farther or maybe even around the house, the orioles would be able to eat with ease. My only solution to this was to place not orange halves, but only a third or a quarter so they can easily access their food without the skin blocking their way. But this means I have to revisit the feeder more often throughout the day. A long term solution would be to add a perch extension. 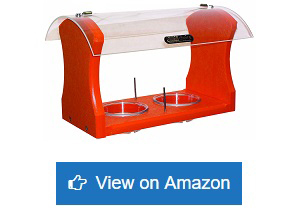 If your priority is having a feeder that will last for a long while, this is a great option. That is if you don’t mind painting it from time to time. If you believe orioles in your area love nectar more than fruits and jelly (some orioles do), then it would be smart to get a nectar feeder that can hold up to 32 ounces of nectar. Perky-Pet Opus Plus offers such a feeder with the 449-2 model. With a clear egg-shaped reservoir, you’ll know when it’s time for a refill. Aside from being transparent, what I like about this feeder is that it is shatter-proof. As I mentioned above, bears and squirrels tend to get attracted to our nectar feeders, so having a sturdy one is necessary. What I love about this model is that its bee guard is very effective. If you have a problem with bees swarming around your feeders and practically causing your birds to leave, then this is a great solution for you! The springs on the little balls that push against the opening work properly to keep bees away from the nectar, while easy enough for the orioles to push down. What I dislike about this feeder, though, is that some birds don’t seem to know how to feed on it unless they see other birds do it themselves. The orange bee guard seems to disguise the holes, causing the confusion. You can improve on this by marking a black dot over the balls to simulate a hole if it really becomes a problem. However, I also notice that once some birds figure it out (even if you don’t put a black spot on the balls), the rest learn how to do it and it’s not a problem anymore. Another comment about this feeder is that after being exposed to harsh sunlight, the seam between the bottle and the feeder wouldn’t seal properly anymore, causing some leakages. It could be due to the plastic material. The leak then attracts insects to the feeder. An easy solution would be to place plumbers’ tape in the threads to seal it up nicely, and it’s back to being a great feeder! All in all, I consider this the best oriole feeder with bee guard. No matter how elaborately-made or beautifully-designed your bird feeder is, if it doesn’t work, it’s useless. 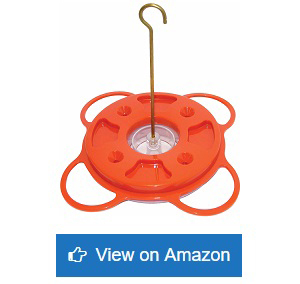 And based on experience, I found that the simplest but most thought-of designs are the ones that work best, much like Heath Outdoor Products CF-133 Clementine Oriole Feeder. I can say this is one of my favorites. The construction of this feeder is simple. It is made of circular steel imitating the outline of an orange half and sits vertical when you hang it up using the attached hanging chain. It has been powder-painted with orange which attracts more orioles. One side can hold two halves of oranges while the other side holds a glass cup that you can fill up with jelly. Out of all the bird feeders I use, this one is the most popular for orioles. Why, you can even see orioles perched nearby waiting for their turn to eat, completely ignoring other feeders! As it is made of durable steel, you can see immediately that it will last for a long while. It’s easy to clean as there is not much to clean really, and the paint doesn’t chip off easily because you wouldn’t have to scrub hard on it. The downside though is that finding a replacement for the glass jelly jar can be troublesome. I had the feeder out one night, and the next day the jar was gone and nowhere to be found (might be due to either bears or squirrels). Heath Outdoor Products doesn’t seem to offer replacements, so what I had to do was look for candle holders. The trick is finding the right size, so I brought the feeder along when I shopped for the replacement jar. Balancing the feeder can be tricky at first, but once you get the hang of cutting the oranges to the right size and filling up the jar with enough jelly, it’ll be easy as a pie. All in all, it’s a perfect choice for a feeder at a great price. Here is another option for nature-friendly people who want a bird feeder made from recycled plastic. Songbird Essentials Fruit and Jelly feeder makes use of a birdhouse design that is brightly orange to attract orioles. Its plastic make is thick and rigid however, its jelly cup is a huge letdown. While the feeder itself looks like it would last a lifetime, the jelly cup is so thin it could break in your hands if you squeeze just above normal. It’s like the disposable fruit jelly cups you buy for your kids. The company eventually changed the flimsy plastic cup to a glass jar, so hopefully it’ll work better. In any case, once you replace the jelly cup, the feeder works fine. Although it has four pegs where you can place half an orange each, you can actually just put two both on the lower pegs. Why? Because the higher pegs when placed with oranges are too high for orioles to reach. Plus there’s no place for the birds to perch if they want to eat the orange at the top. It is still a great and attractive feeder as its bright color really draws orioles in. And unlike other plastic feeders, its color doesn’t fade as much even after a couple of years use and it doesn’t crack under the intense heat of the sun. 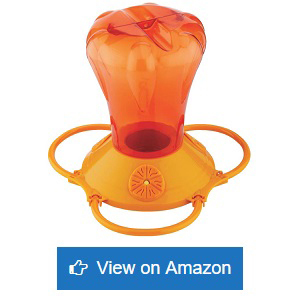 If you’re looking for a nectar feeder with a large capacity, Stokes Select Oriole Feeder is a good choice. With 34 ounces (two ounces more than other big feeders) of capacity, you wouldn’t have to add your nectar mix every few hours. Both the bottle and the base feeder are orange in color, which attracts orioles. Plus the bottle is translucent so you can see how much more nectar it contains even from afar. The bottle reservoir has a big enough hole to put my hand through, allowing me to clean it properly. Some reservoirs have small openings that make it harder for you to clean without a long cleaning brush, but this one is not like that. The material of the bottle, however, is not as thick as other feeders which can be problematic if bears come in and have a go. What I don’t like is that the bee guards can’t seem to keep bees away. Bees can easily push the covers in the port holes, so in they go and get drowned. Also, much like the Perky-Pet Opus Plus model we mentioned above, orioles don’t seem to know how to drink out of it at first. They need to learn by watching other birds (like the Hummingbirds that frequent our yard). This is not one of my favorites, but it still works properly. And with its huge capacity, you can have it up for days without having to do a refill. The Perky-Pet 253 Jelly Feeder is another favorite of mine. It’s a set-it-and-leave-it type of jelly feeder. All you have to do is place jelly inside its reservoir jar, plug it to the base feeder, turn the knob and voila! Jelly ready for eating. You can also just screw the base feeder on any standard jelly jar in the market, so no need to wash the jar and put jelly in: just buy jelly and plug directly. 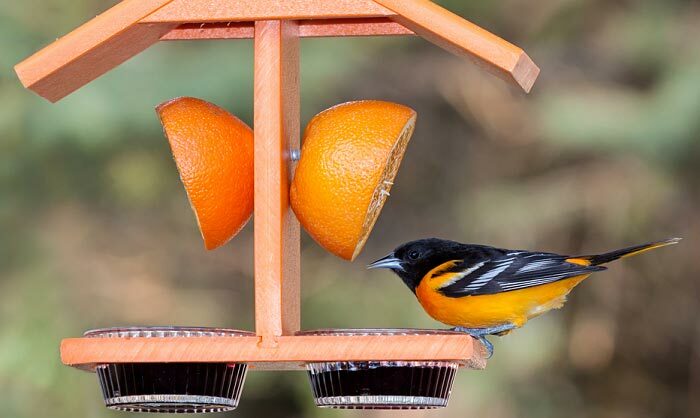 It’s a unique feeder since you may notice that most oriole feeders use jelly cups that you have to fill up every couple of hours. The knob under the orange base feeder allows the paddle inside to move the jelly and dispense several spoonfuls on the tray. It also has a wrap-around perch which allows several orioles to eat at a time. Some orioles even use the orange chains when the perch is too crowded for their liking. It is important to note, though, that the base feeder has holes in it likely to prevent water from accumulating. Because of this, make sure not to place this feeder in your porch as the watery juices of the jelly would drip on your porch’s floor. Also, since you’re putting out a jar of jelly, be mindful not to place this feeder where the sun would shine on it directly. The heat can cause the jelly to either liquefy or turn bad. The only thing I don’t like about this Perky Pet Oriole Feeder is that when you place a jar filled with jelly, it will completely block your view of the other side. So if orioles feed on the opposite side, you can hardly see it. But since this feeder attracts many orioles, I can still enjoy watching the others eat. As far as top choices go, this is one of them for me. And for the price, it’s a purchase you’ll never regret. Tip #1. Choose a Feeder that allows you to offer at least two types of oriole food. Choose a feeder that offers at least two of these. If you can’t do that, buy oriole feeders of different types. The orange fruit not only attracts orioles for the food, but also for the color. Keep in mind that when these birds look for a mate, they search for the orange plumage. This could be the reason why Orioles will come to your place when they see this color. The brighter the “orange-ness” of the feeder, the better. If the color lasts a long while, that’s a huge plus. Although I did list some feeders that offer only nectar, I would recommend still putting out a Jelly feeder to complement it. Jelly is the favorite of our orange-colored feathered friends. Grape jelly is my number one go-to if I really want to attract orioles as these birds seem to prefer this type among others. Although orange attracts them and nectar fills them up, not all orioles love the fruit and partake in nectar. But they would definitely wait their turn when they see grape jelly, so get yourself an oriole jelly feeder such as Perky-Pet 253. Durability is an important factor in choosing an oriole feeder because it will surely be exposed to harsh elements such as the wind, rain and the heat of the sun. Being baked under the sun can cause plastic to warp and be brittle, so if you’re opting for a feeder made of plastic, make sure it’s thick. Other animals such as bears and squirrels can get attracted to the feeder, too. Nectar and jelly are great food choices for them as well. Sometimes they would knock the feeder off the hook. Because of these instances, I would not recommend feeders made of glass. Because you’ll be providing food that can go bad, make sure your feeder is easy to clean. If bits and pieces of old food remain, it can spoil the new food that you place. Oranges tend to rot faster when there are rotten orange bits in the peg that you place them in. The same can happen to jelly. It would be unhealthy to offer them tainted food. Also, a dirty feeder can breed bacteria and diseases. Many beginners in bird feeding and bird watching tend to go for the cheapest feeder in the market. However, the cheapest is not always the most affordable because many cheap feeders end up broken or completely unusable after setting them out. Go out and compare available feeders and listen to other people’s experiences. In my experience, you can purchase a feeder that is worth less than $10 but lasts less than a year, or you can purchase a $30 one but last more than five years! Which one is more affordable then? The pricier one! Although, the higher the price doesn’t also mean it will last long. It all goes back to listening to what others have experienced. Keep in mind that if it is your first time putting out an oriole feeder, orioles will not immediately flock to it. Sometimes it takes a few seasons before orioles start coming in. They need to “know” first that food is being set out for them in your area, and this takes a while. Once they know that they can find food in your place, they will build their nest within your vicinity. Sometimes you would prepare a feeder for them because you saw one in your garden a few days past. But this doesn’t mean they’ll immediately come back to your area when you put a feeder out for them. They are constantly searching for food. And if on the first time they did not find any in a certain location, they move on. So if you don’t see any orioles this year, make sure to set your feeder up again early next year. The key here is to never give up until they come. What is an oriole feeder? An oriole feeder is as its name implies: a bird feeder specific for orioles. Unlike hummingbirds (which are one of the most common birds frequenting gardens), orioles are a bit larger in size and have bigger beaks. Sometimes an oriole would try to feed on a hummingbird feeder and would find it difficult because the port holes are too small for their beaks, and the perches are too narrow for them to balance on. An oriole feeder usually comes in orange color, has bigger port holes (if it is a nectar-type feeder) and has wider perches. Other oriole feeders also allow for placement of either jelly or orange halves, or both. An oriole feeder works by attracting orioles passing by with its bright orange color. As previously mentioned, this type of bird loves the color orange. Once they get attracted, they immediately fly down to investigate. Sure enough, if your feeder contains either nectar, orange or jelly, the birds will come a bit closer to further inspect the food. Once they feel that it is safe to eat, they will consume their fair share. What are the different types of oriole feeders? A combination of all or any two of the three. The nectar feeder is a reservoir type that allows orioles to feed through port holes. The jelly feeder usually comprises of a cup to place jelly in, while the orange feeder just needs a peg to put the orange half through. You can actually replace jelly with mealworms too, if you like. 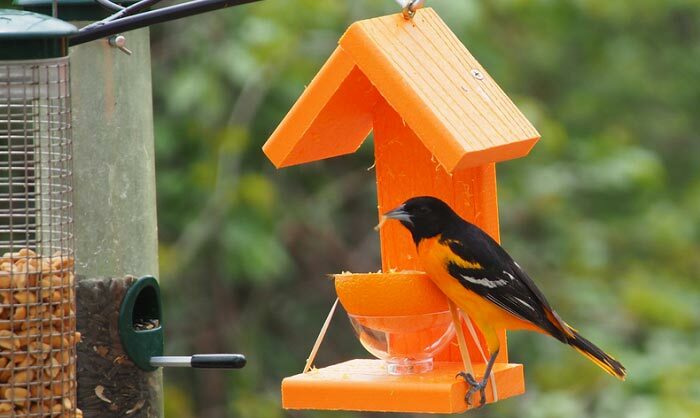 Why do you need an oriole feeder? Orioles may eat in other bird feeders, but if these feeders do not contain the food they love, or if they feel uncomfortable eating on them, they will definitely leave. So if you want to attract Orioles and keep them coming back to your garden or yard, you must use a feeder specific to their needs. What are good oriole feeder brands? Our top recommended oriole feeders fall under these brands. Start as early as you can. They arrive within the first few days of spring so make sure your feeders are out already. Use the color orange to entice them. You can either use an orange feeder or plant orange flowers in your garden. The more visible through the sky, the better. Give them their favorite foods. Offer them orange halves, nectar and jelly (grape jelly is their favorite). The nectar mix should be of lower concentration than what you give to hummingbirds. You can start with eight parts water to one part sugar, up to five parts water to one part sugar. Observe which mix they like the most by checking how long the nectar lasts. Make sure the food is maintained fresh. Even birds are choosy with what they eat. If you set out an orange half too long and it rots in the feeder, it will deter instead of attract orioles. Plus keeping their food fresh is our way of keeping them healthy so they can come back next year. Keep putting out your oriole feeder even if no orioles are coming in. Orioles take note of their possible sources of food, even if they haven’t eaten from your yard yet. Don’t give up! Are bees a problem with oriole feeders? How to keep them away from feeders? Yes, bees and ants are definitely a problem you will face. Bees will get attracted to both the nectar and jelly. With nectar-type feeders, you can use those with bee-guards. A bee guard covers the port hole so that bees won’t be able to enter, but still allows orioles to feed with a simple push. Look for feeders that have a reliable bee guard, because some brands have weak port covers that are too easy for even bees to push. Spring-loaded bee guards work best. Dripping and leakage from feeders will also attract a swarm of bees, so make sure your feeder isn’t leaking. Even if you have a bee proof oriole feeder, if it’s leaking elsewhere, it will still attract bees. As for jelly cups, I would recommend placing a bit of water over the jelly. Orioles aren’t bothered by it, but bees find it hard to partake of the jelly. Also, if any part of your feeder has the color yellow, paint over it as this attracts bees. If it still doesn’t work, try to take your feeder down for a week or move it to a different location. Others would recommend placing oil around the port openings, but the danger would be having the oil get on the birds’ feathers and hampering their flight or affecting their health. Finally, switch to offering just oranges and mealworms. Bees are not interested in these two and would likely leave your feeder alone. As for ants, using an ant moat will solve your problems. 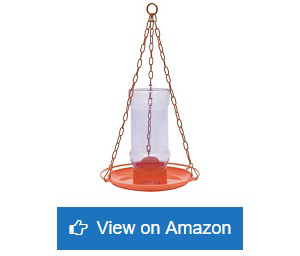 Can you use an oriole feeder for hummingbirds? The only major difference between oriole feeders and hummingbird feeders is that the former’s feeding holes are larger. Orioles can have some difficulty using a hummingbird feeder, but hummingbirds rarely experience issues drinking from an oriole feeder. Keep in mind though that if there’s a group of orioles feeding from a feeder, hummingbirds will not approach, and vice versa. Where and when to place oriole feeders? The best time to put your feeders out is during the last few days of March or at the start of April. Some would suggest early May, but if you put it out too late, you might miss your chance. Just keep in mind that you have to prepare the feeder at the very start of the spring to catch these migratory birds. Keep placing the feeder out until late fall. If orioles still keep coming, keep providing them with food. They will stay in your place while you still provide them what they need and until they feel that they really need to move for the winter. Keep the feeder out up to two weeks after you see the last oriole feed just to make sure nothing is depending on your feeder anymore. When it comes to proper placements, place the feeder where it can easily be seen by the birds. Orioles fly high above when migrating and like to perch at the tops of trees when they’ve arrived at a location they like. At the beginning of the season, place the feeder in high, open spaces to catch attention. When you’ve already caught their attention and they frequent your yard, you can move your feeder to a somewhat shaded area, especially if you’re using the jelly reservoir type feeder like the Perky-Pet 253 to keep the jelly from going bad. How to use an oriole feeder? It depends on the type you have. If you’re using a nectar reservoir, then you simply prepare your sugar and water mix. If you’re using a jelly-and-orange-type feeder, fill the jelly cup with grape jelly and place orange halves on the pegs. How to clean oriole feeders? Cleaning a feeder must be done at least once every two weeks. Sanitary feeders are necessary for keeping our birds healthy. Orioles are also picky eaters and would not eat rotten food so make sure to change it every couple of days. Soak completely in a cleaning solution. This can help loosen dry and sticky dirt. You can use a teaspoon of unscented dish soap or liquid detergent mixed with a bucket of water. Brush or scrub thoroughly. Use a special brush for hard to reach areas. Soak the feeder once more, but this time with a vinegar mix. Fill your bucket with water and add four cups of vinegar. Let it soak for one hour. How do you make an oriole feeder? Creating a homemade oriole feeder is easy enough if you have the know-how. You can use either metal or wood for your feeder. 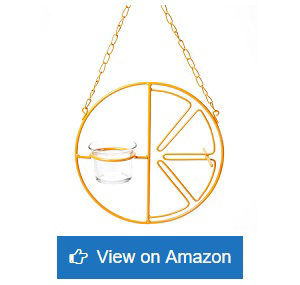 All you have to do is create a space to place an orange half or secure a cup for jelly, and of course add a perch. Paint it with orange to attract orioles. Find a straight or curved rod. A length of about 16 inches would be ideal. Curve it to an “S” shape, with the upper curve only about two inches in diameter, and the lower curve about four inches in diameter. Get a branch with a diameter at least twice that of the rod. Drill a hole through it to fit the rod through, but make it tight enough so the branch will remain steady even when the rod is inserted through the hole. Put the branch through the rod on the lower curve, about an inch or so above the lowest point towards the middle of the “S”. Alternatively, if you know how to weld and you have the tools (and you don’t want to use wood), get a shorter rod of about four to five inches and weld it about an inch or so above the lowest point of the lower curve towards the middle of the “S”. Put an orange half through the end of the rod at the bottom, and hang it up using the upper curve which serves as your hook. Voila! You have a simple oriole feeder of your own make. Orioles, whatever the species you have in your area, are lovely to look at and even take photos of. Having these birds play and feed in your garden would surely bring delight to you and your family. The best oriole feeder is not only the one that can attract orioles most, but also the one that can make them stay. And if they feed in your garden now, they will surely consider your place their home when the next spring comes.